- Prestashop Exit Intent pop up helps in encouraging visitors to complete their purchases. - The Newsletter popup addon helps in engaging visitors for a longer time on your store. - The interactive email subscription pop up helps in converting store visitors into customers who would have otherwise left the site. - The responsive Newsletter pop up helps in generating leads. 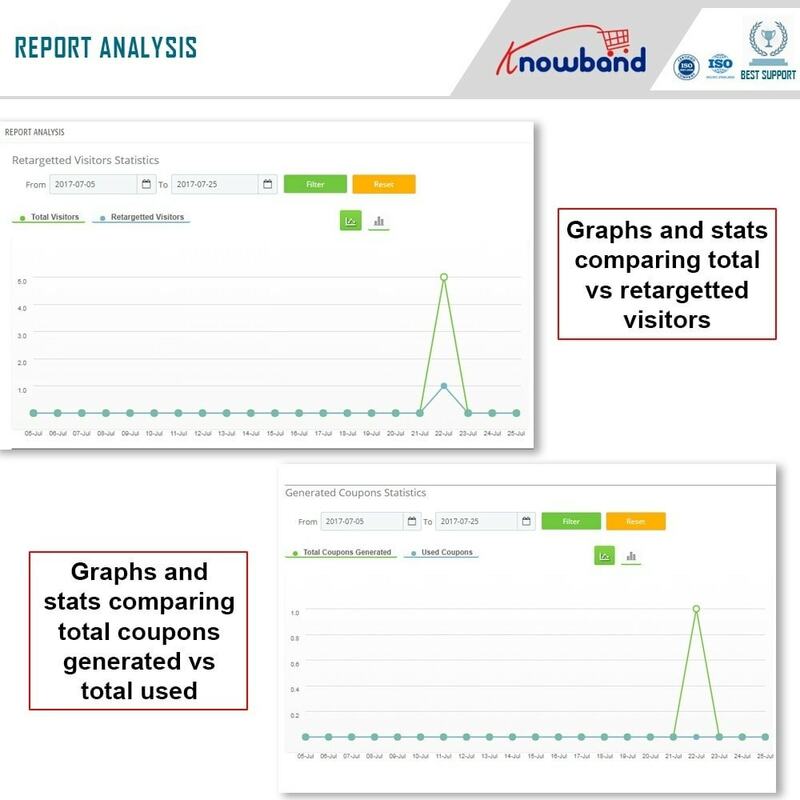 It motivates the customers to repeat sales by encouraging customers for buying more products by using the coupons shared. - Prestashop Newsletter popup helps in getting the email addresses that can be used for email marketing or personalized promotions. 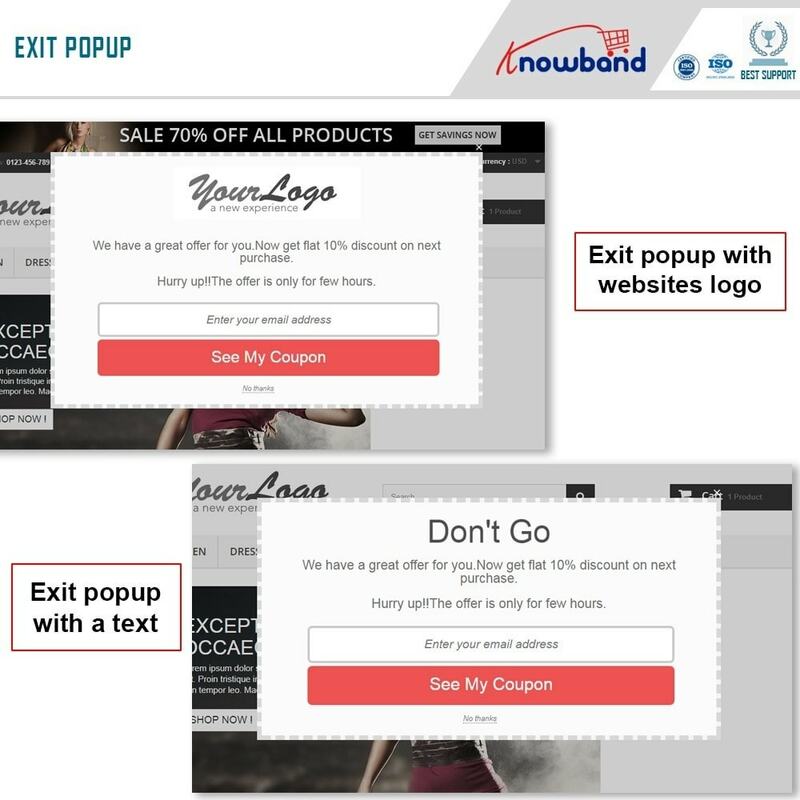 - The responsive exit intent pop-up module helps in connecting to the users by automatically subscribing them to your newsletters. - Prestashop Newsletter subscription popup helps in converting a visitor into a potential buyer. 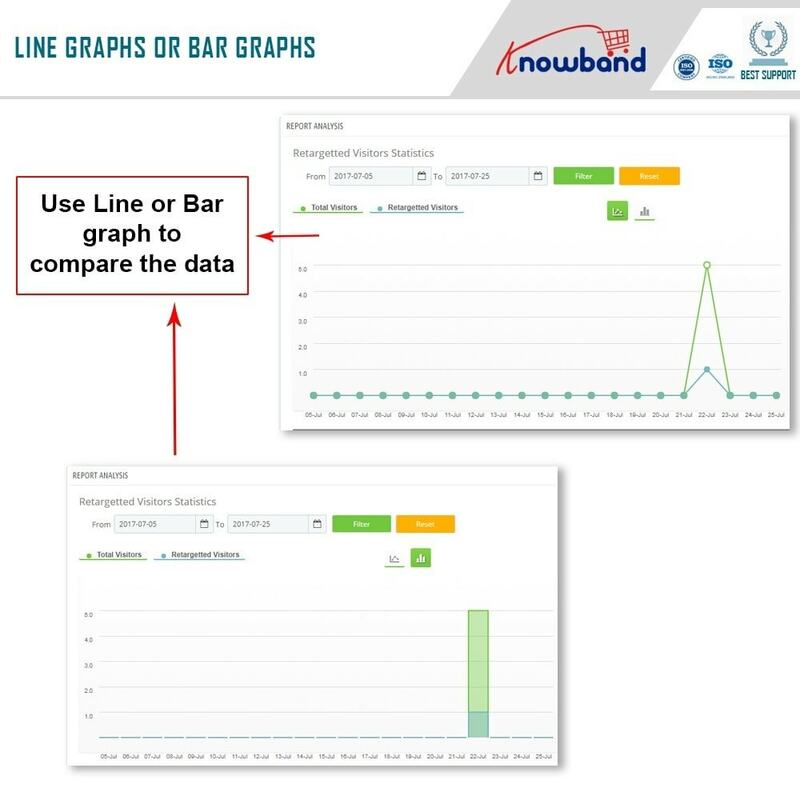 - Offers detailed stats about the performance of the module. - Admin can get the free plugin for testing purposes. Prestashop Exit popup plugin is based on the exit intent studies and analysis, & cookies tracking which shows a Newsletter pop-up to the users who try to leave the website. 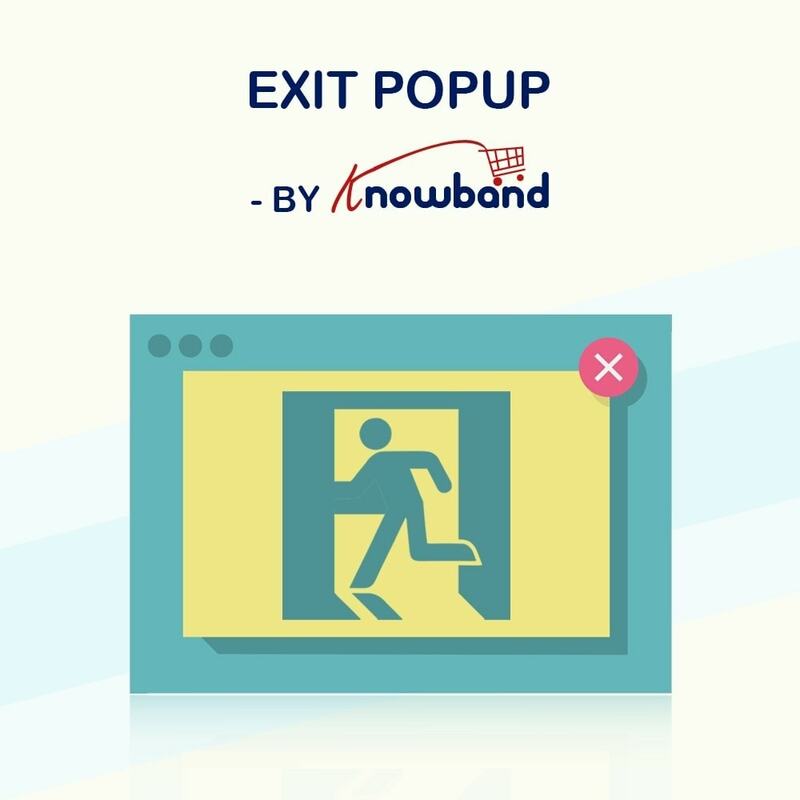 This Interactive Exit Intent pop-up can be customized and configured to show a discount coupon or offer to keep the customer from leaving the site. This Prestashop module is an ultimate solution to get the conversions even from those customers who would have otherwise left the site without any purchase. - Enable/disable the exit intent pop up anytime you wish to. - Option to add the title to your exit pop-up window. - Option to show logo on the email subscription pop-up instead of the pop-up title. - Add customizable texts to describe the offer in the exit pop-up window. - Customize the call-to-action button text and color from admin panel. 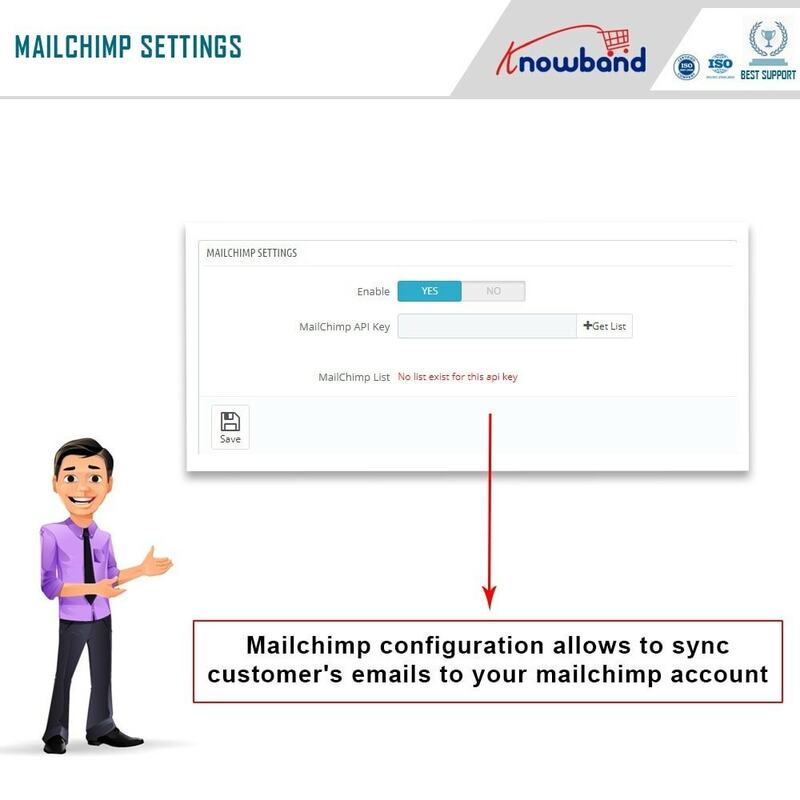 - Separate controls for completely customizing the look and feel of the email subscription pop-up. 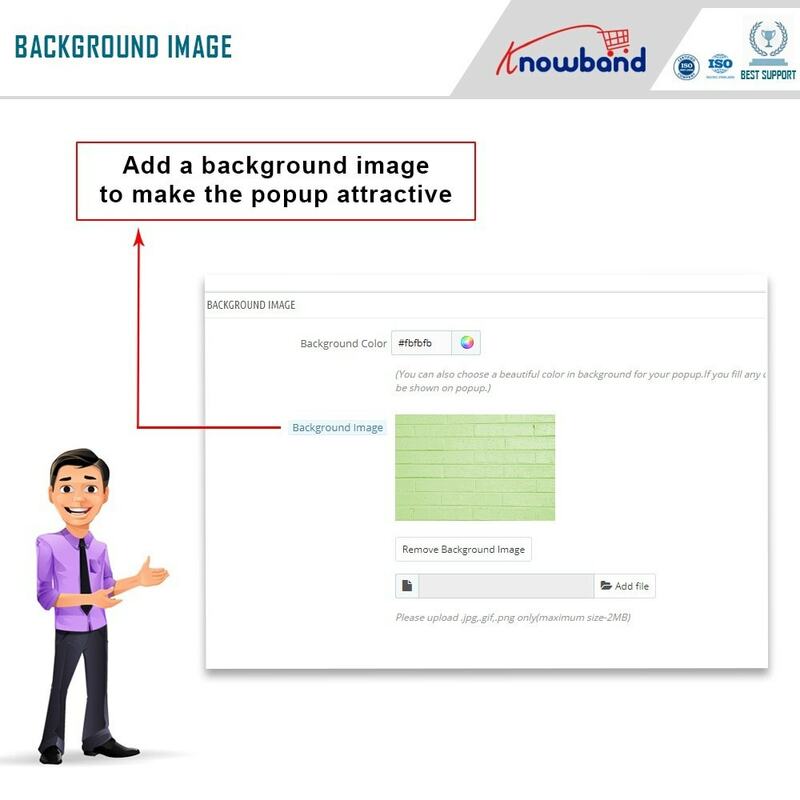 - Option to add a custom background image to the exit pop-up window. - You can also choose to show a solid-color background if not a background image. - Customers will provide their email address to receive the discount coupon code. - You can automatically register the customers with their provided email address. - Password and user id details will be sent in an email notification to the customer. - Option to automatically subscribe the customer to your newsletters. - Set the number of days after which cookies will expire automatically. - Enable aggressive mode for testing, where exit pop-up will always appear independent of the cookies setting. 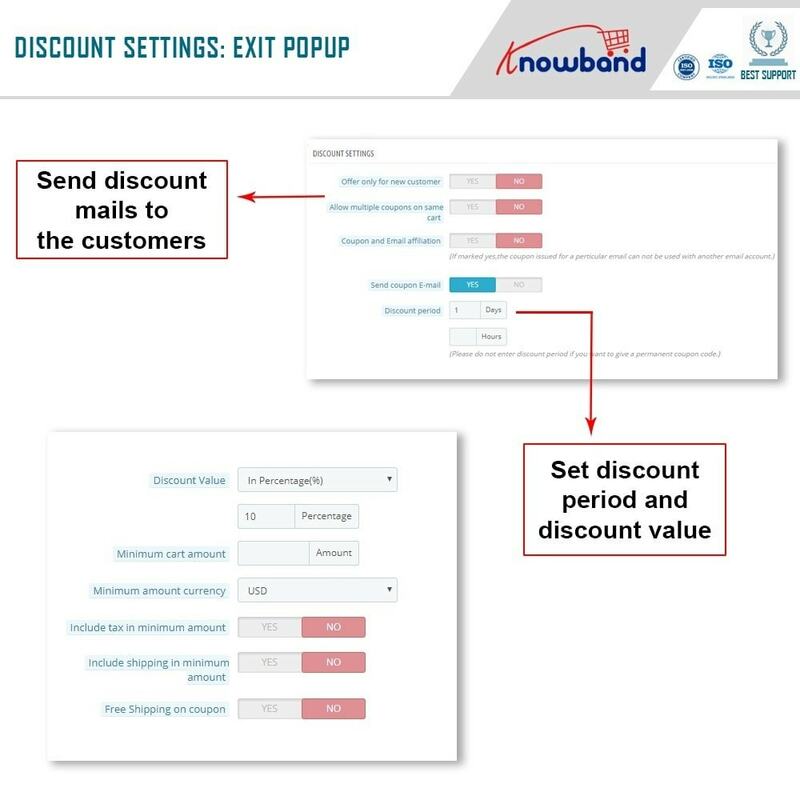 - Separate discount coupon management controls for the addon. - You can choose to show coupons only to the new customers; not registered. - You can allow or restrict a customer from using multiple coupons on a single cart. - You can choose to link a coupon code to a particular email address only. - Set cart rules such as discount period, discount value, minimum cart amount etc. - Set a discount value as 'fixed amount' or in 'percentage'. - Set minimum cart amount to use the coupon code. - Enable/disable free shipping on coupons. - Translated into 17 different languages already. - Aggressive Mode for module testing purposes on a particular IP address. 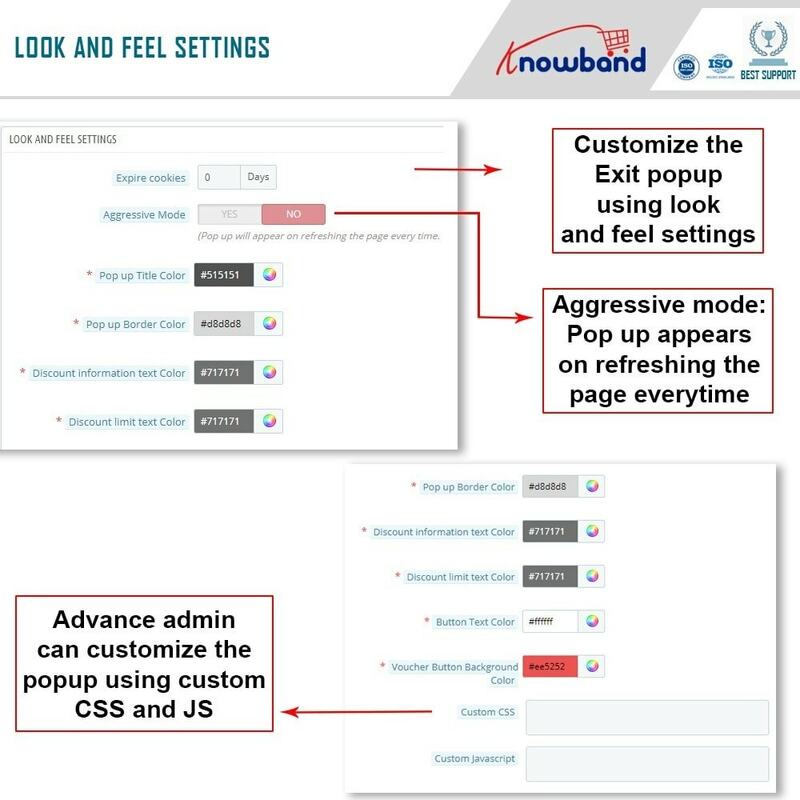 - Design customization options to optimize the pop-up window as per your requirement. - No technical knowledge is required to configure the module. - Multi-Language support on stores which have enabled the multi-language feature of PrestaShop. 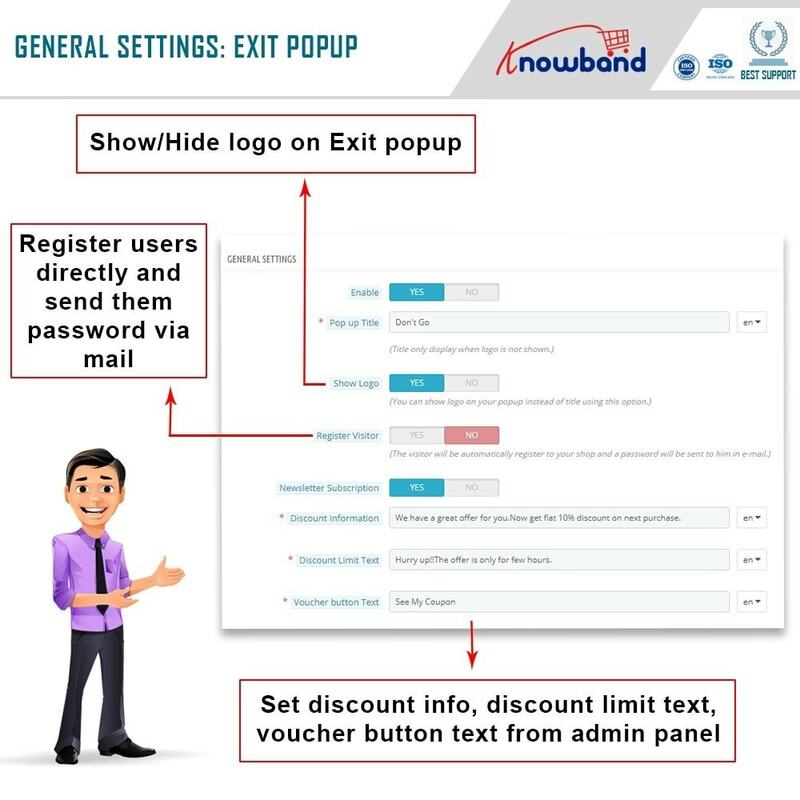 They will love the discount coupons shared in the exit Intent pop-up window. They will like the quick way to register a user account on your shop. They will like the optimized buying experience and would be encouraged to shop again at your Prestashop store. They will like the automatic newsletter subscription when you will send the offers in the email. [ADD] Option to display Fireworks on the Exit popup. [ADD] Option to create Desired coupon code. [ADD] Option to display the Popup on selected pages. [ADD] Option to select the visitors to display the Exit popup. [ADD] Option to display the popup using Geo locations. [ADD] Readymade Exit popup themes. [ADD] Option to generate the coupon with email id.